In the summer of 2015 the Ecology School of Saco Maine had the opportunity to purchase a historic farm along the Saco river some five miles inland from their current location on Ferry Beach. The School has run small, seasonal residential education programs out of their current leased location for twenty years and this chance to purchase a beautiful riverfront farm that was bound by conservation lands was one they could not pass up. Understand the positive outcomes a Biophilic design client meeting can bring. Understand how to approach the Materials Petal of the Living Building Challenge. 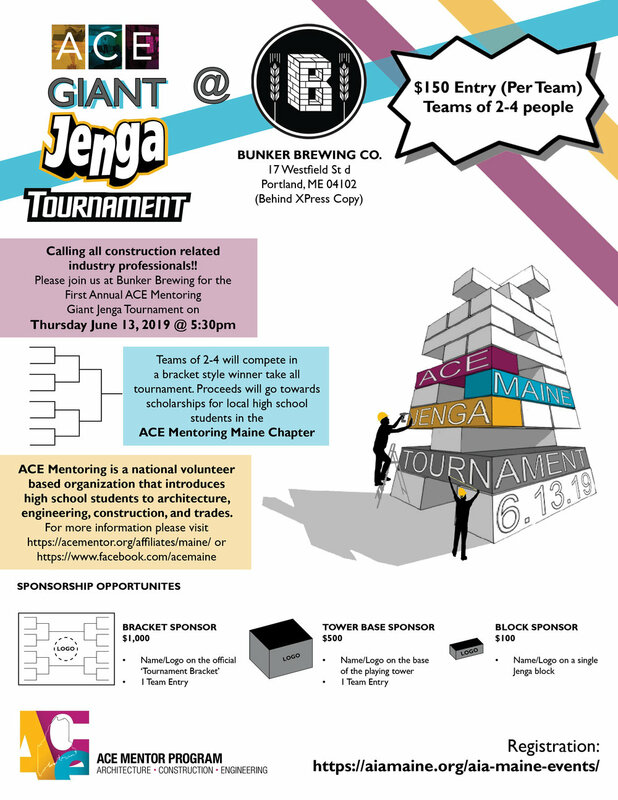 Come join us and learn more about the ACE Mentoring Program while competing in a bracket-style winner takes all Giant Jenga Tournament with your friends in the design and construction industry. ACE will be celebrating over 10 years of architecture, construction, and engineering mentorship in the Maine community and proceeds will go towards scholarships for local high school students in the ACE Mentoring Maine Chapter. If you are considering applying to become an AIA Fellow in 2019, it’s time to get started. Please join AIA Maine Fellows Pamela Hawkes, Gunnar Hubbard, and Scott Simons for a discussion of the practical realities of applying for Fellowship. A gathering has been planned for Thursday, April 4th at 4:30 at the Scott Simons Architects studio in Portland or by video conference. I can't make this event but I have interest in future conversations. To join by video conference, use this link at the scheduled date and time. Attend the BuildingEnergy Boston Conference + Trade Show, the region's premier event for professionals and practitioners in the fields of high-performance building, energy efficiency, and renewable energy. Hosted by the Northeast Sustainable Energy Association (NESEA), this year's event is Wednesday through Friday, March 14-15. Tour Northern New England's First Office to Meet WELL Building Standard™ Certification. Join us for our first social of 2019. 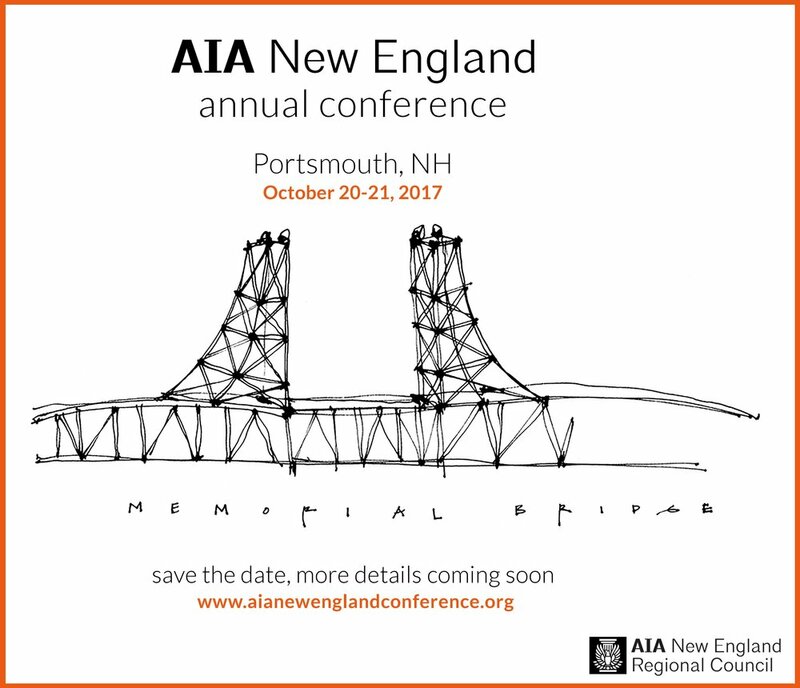 AIA Maine’s Women in Design + Construction and Emerging Professionals Committees are collaborating to present this exciting event. 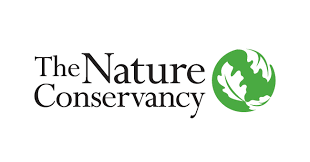 Tour the Nature Conservancy in Maine. Earn learning units while gathering with colleagues as you tour The Nature Conservancy in Maine’s new office building located in the historic Fort Andross Mill in Brunswick. You will hear from the architectural team, led by Harry Hepburn of BRIBURN, the sustainability team, led by Heather Walters at Thornton Tomasetti, as well as leaders from the client team at The Nature Conservancy in Maine. The team will discuss their collaborative efforts to create a space that supports staff well-being and productivity, models green and sustainable design, and inspires innovative and collaborative problem-solving. This project is on target for LEED Gold certification, and to be the first office in northern New England, and the first non-profit space in the Eastern U.S., to meet the requirements for the WELL Building Standard™ certification. Any ideas/thoughts you would like to share with our Women in Design + Construction group? Event of Interest by Allied Member: CENTRIA | Insulated Metal Panels, What is Next? Join us on December 11th for our annual meeting to socialize and celebrate the collective achievements of 2018. AIA Maine Members, submit your 2018 Achievements by December 5th here. 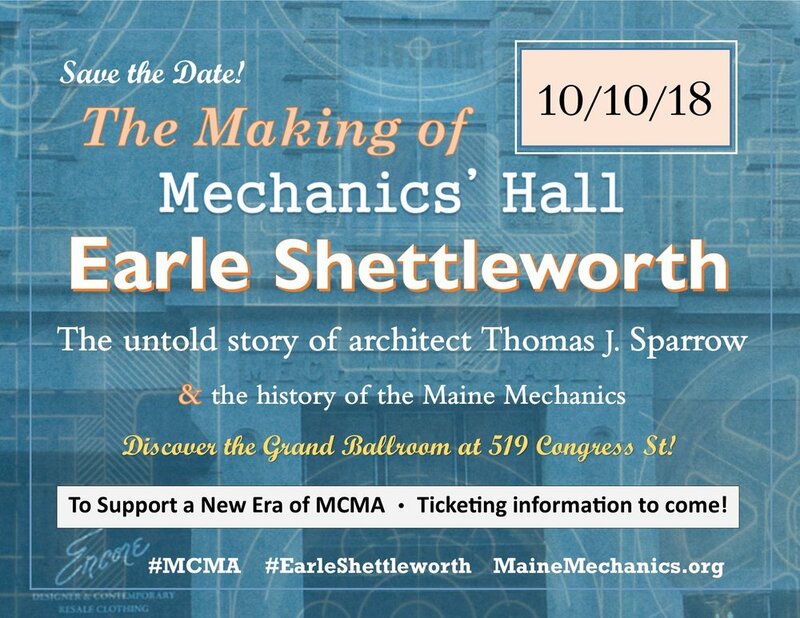 Please join us at Mechanics' Hall on Wed. Oct. 10th at 7pm when Maine Historian Earle Shettleworth will lecture on the untold story of Hall architect Thomas J. Sparrow. The title of Shettleworth's talk is "Buildings for All Times and Seasons: The Work of Thomas J. Sparrow, Portland’s First Professional Architect". The event will take place in the Grand Ballroom at 519 Congress Street (across from MECA and Portland Media Center). Visuals to accompany. Refreshments will be available. Patron tickets will also be available. They will include priority seating and a cocktail hour at 6pm with Shettleworth in the MCMA library - hors d'oeuvres provided by David's restaurant. The Upjohn program funds up to six research grants of $15,000-$30,000 per recipient annually for projects completed in a 6- to 18-month period. The research should relate to architectural knowledge that can be applied within the discipline. One grant will be dedicated to design and health principles. Maine Huts & Trails maintains a network of backcountry trails and remote wilderness lodges woven through the woods and mountains of western Maine that provide a unique opportunity to explore and discover this beautiful region. The goal of this year’s competition is to study and develop a design for a new hut on a established backcountry site, as well as to explore the implementation of mass timber construction technologies in a remote location. A detailed Design Brief is available here and response to questions will be posted to this site until the close of registration in August. First Prize project will be recognized with a $5,000 award. Winners will be announced at the October 11th Awards Ceremony at University of Maine Mass Timber Conference at University of Maine, Orono, Maine All entries will be displayed at the Awards Ceremony, and on our website. Submissions for the 2018 Emerging Professionals Exhibit are now being accepted. This is open to any architecture student, recent graduation, or architect licensed fewer than 10 years. Deadline to submit is August 6. 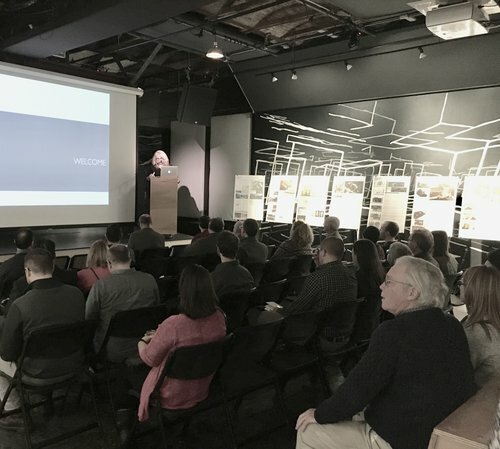 In collaboration with AIA Maine, angela adams is happy to host a night of design, conversation and inspiration for our local residential and commercial design trade community. Join us for the AIA Maine Design Awards 2018 Celebration. Our biennial program recognizes excellence in Maine architecture. Experience an evening of great architecture and design, showcasing Maine’s best architectural projects in a unique space on the Fore River in Portland. The Maine Wood + Sustainability Conference May 9 in Portland features practitioners in innovative design, high-performance construction and sustainable forestry. The keynote speaker is Tom Chung, principal architect of the award-winning Design Building at UMass Amherst, one of the first cross-laminated timber (CLT) buildings constructed on the East Coast. 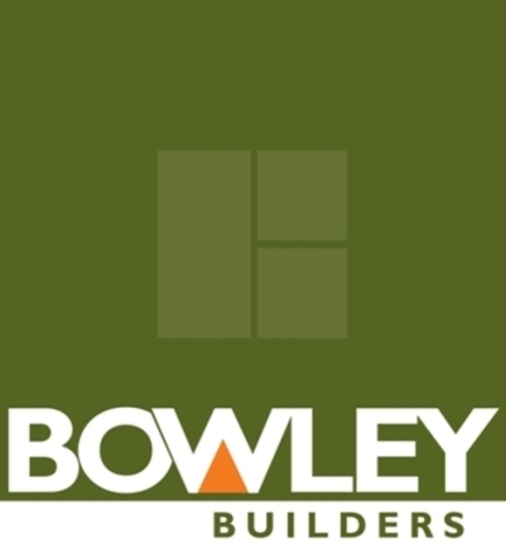 Conference presenters include a CLT manufacturer, architects, builders, foresters and wood producers. The conference is jointly organized by AIA Maine, passivhaus MAINE and Local Wood WORKS. Join us to tour an unusual new 2-unit condominium on Danforth St. in the West End. This is a collaborative project between Kaplan Thompson Architects and Constance Bloomfield, the Owner/Developer who is also an Architect. The building successfully bridges the gap between contemporary design and the requirements of historic preservation. Preliminary drawings were done by Constance and design development and construction drawings were done by Camila Atkins, of Kaplan Thompson. Catherine Callahan of Callahan + LeBleu, LLC is the landscape architect for the project. As in all Kaplan Thompson projects, great care was taken in the design and execution of the exterior walls, to ensure that the building substantially exceeds state energy requirements. The units have spectacular views of the Fore River and many other amenities for the future owners. 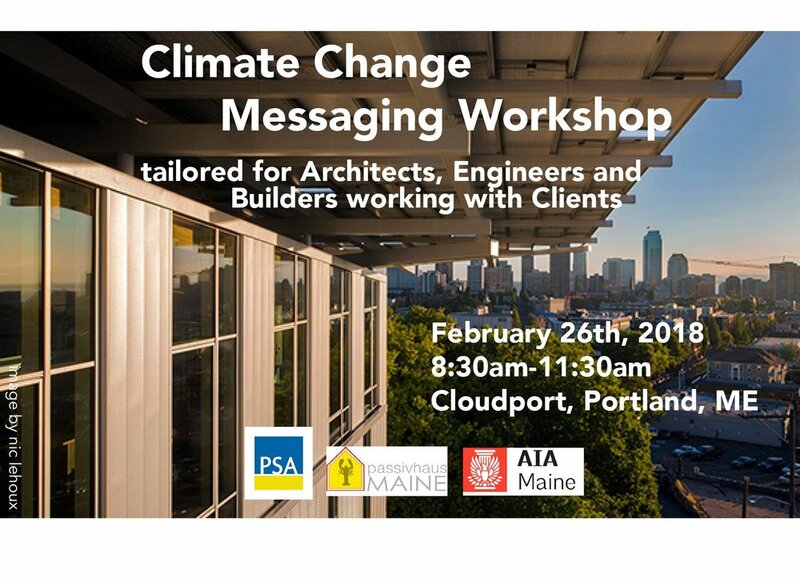 Join the Maine Climate Table and co-hosts passivhausMAINE, AIA Maine and Portland Society for Architecture to explore the results of in-depth research about climatechange messages that resonate especially well with Mainers. This interactive workshop is tailored for communications and policy professionals at nonprofit and for-profit organizations across Maine. Save your seat at the table, Monday February 26th at Cloudport in Portland. Space is limited and available on a first-come, first-served basis - Sign Up Today! Over the past three years, the Climate Table has worked with Goodwin Simon Strategic Research, a national opinion research firm, to help us understand what Mainers think about the impacts of climate change, including what they are seeing in their everyday lives. We've identified opportunities to connect with our neighbors and colleagues on projects and solutions that have the potential to bring communities together. We hope you'll join us to learn about the results of this research and to bring your own expertise to bear as we discuss ways to communicate effectively about climate change in Maine. Tyler Kidder of Grow Smart Maine and co-chair of Energy Efficiency Sub-Committe of the Climate Table will lead the conversation. The Maine Climate Table is a broad network of more than 120 organizations and individuals from the nonprofit, philanthropic, government, and business sectors that has been working since 2013 to increase civic engagement and undertake actions aimed at protecting Maine's environment and economy from the adverse impacts of climate change. The group is governed by a Steering Committee currently comprised of the following organizations: Island Institute, Maine Farmland Trust, The Nature Conservancy, Coastal Enterprises Inc., Maine People's Resource Center (our fiscal sponsor), Unity College, and Lee International. There are several active subcommittees, each chaired by different organizations, including the Messaging Subcommittee chaired by Liz Rogers of CEI, and the Energy Efficiency Subcommittee chaired by Suzanne McDonald of the Island Institute and Tyler Kidder of GrowSmart Maine. Join us on December 12th for our annual meeting to recognize 2017 member achievements and celebrate the 2017 Unbuilt Design Award winners. 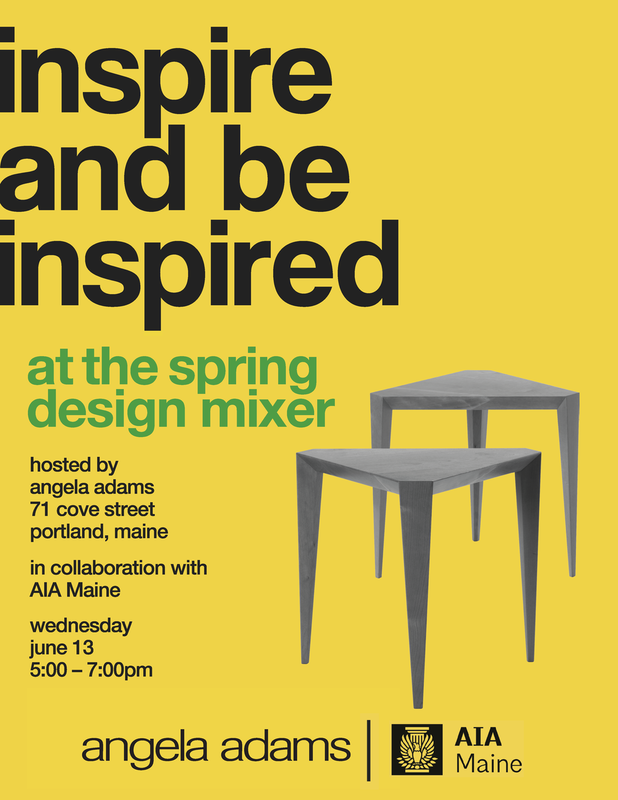 Join angela adams to inspire and be inspired at the fall design mixer. Socialize with fellow design professionals at the angela adams Middle Street storefront. In collaboration with AIA Maine + MIDA. Join us to learn more about the fellowship application process and to make connections with local AIA Maine Fellows who are willing to share their experience. Architects who have been AIA members for at least 10 years are eligible to apply for the College of Fellows. However, this event is for anyone who is interested in learning more about the fellowship process. ACE is a national volunteer group with a chapter in Portland that reaches out to local school to provide information and mentoring to students who are in a S.T.E.M. related career. 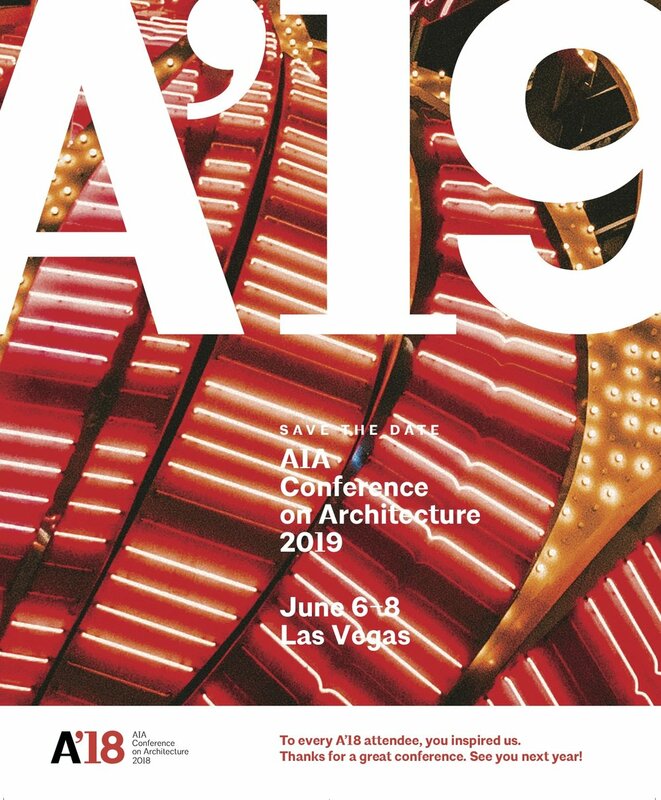 To All interested in the fields of architecture, construction, and/or engineering come support the ACE Mentorship Program and engage with your colleagues in the profession! Join us for casual conversation and informal networking as we explore interest for an ongoing Women in Design + Construction group.